Fight for glory in madcap mini-games presented by a rascally host – thanks to the PlayLink for PS4. Frantics is all about 15 whacky mini-games for up to four players, where you’re competing in everything from frenetic action arena brawls to strategic turn based competitions. Exclusive to PS4, this PlayLink game challenges you to win more ‘crowns’ than your friends. Put your DUALSHOCK 4 wireless controllers to the side – here you can simply use your smart device to swipe, tilt, shake, flick and snap your way to victory. Anyone can do it! But beware… the scheming and manipulative Fox is on hand to stir up the pot. Using bribery and relaying secret messages and missions to each player via your mobile device, you’re encouraged to sabotage and backstab your rivals at every turn. With this crafty vulpine’s tomfoolery changing the way you play at any time, you’ll need to have your wits about you to triumph. Be the first to the finish line as you race through a track full of random obstacles – and fiendish traps provided by the Fox’s bag of tricks, of course. Be the last animal standing on a slippery platform where even standing still is a challenge – don’t be afraid to hop on top of your rivals’ shoulders to stay alive. Collect as many donuts as you can within the time limit in a jousting arena where you can jab and slam any rivals in your way. Who can hold their nerve and open their parachute last, in a free falling game of chicken? Survive as long as you can in an arena full of falling bombs – preferably by throwing them at your opponents! Trick your rivals into stepping onto mines while you grab the prized soup and bring it back to the finish line. 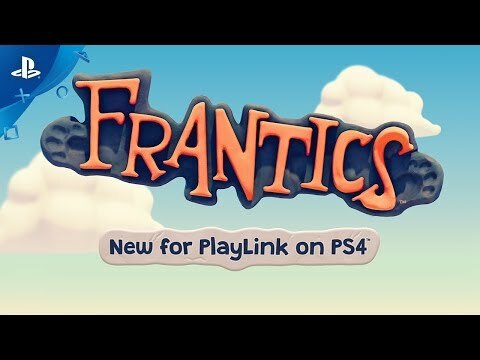 Frantics is just the start – discover more wonderful social gaming experiences on PlayStation 4 in the PlayLink range.